In this video, you will learn about conforming your board back into Storyboard Pro. Once you have imported your project’s conformation (XML or AAF) into the third party software and completed editing, you will need to export it once again as an XML or AAF file to bring it back into your Storyboard Pro project. NOTE Refer to your third party software’s documentation to learn how to export the animatic project in an XML or AAF file format. IMPORTANT You can only reimport a modified conformation XML or AAF file into the original project from which it was first exported. For more information about the options, see Conformation Import Project Dialog Box. The Import Project window opens. Click the Browse button and locate your XML or AAF file. Process Audio: Uncheck this if you don't want the changes done to the audio tracks or sound clips in the sequence you're importing to be applied to your Storyboard Pro project. Your project's audio tracks will be left untouched. Process Video: Uncheck this option if you don't want the changes done to the panels, scenes or transitons in the sequence you're importing to be applied to your Storyboard Pro project. This can be useful if you only wish to conform edits to the project's audio tracks. 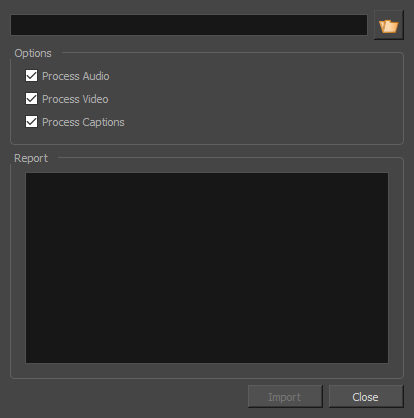 Process Captions: Uncheck this option if you don't want changes to captions done in the sequence you're importing to be applied to your Storyboard Pro project. Click OK to return to the Import Project window. The Report section displays information relative to the conformation process. If an error happened during the conformation process, this is also where the details relative to this error would appear.